I've been a little lax on posting recently. It's a long story that I'll get into at a later day. But since today is the last day of the month, and I only have an hour left of the day, I need to get my book post in! 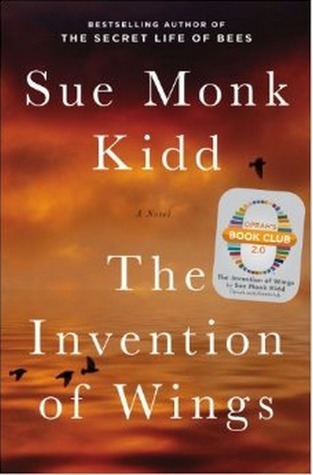 This month's featured book is "The Invention of Wings" by Sue Monk Kidd. Honestly, I'm too tired to give this book the review it's due. But here is a little teaser: This book primarily tells the stories of Hetty "Handful" Grimke and Sarah Grimke and is set in early nineteenth century Charleston. Though the girls have the same last name, their relationship is not of sisters, but of owner and slave, as 10-year-old Hetty was given to Sarah for her 11th birthday. The novel follows them throughout the next three decades. Though the two come from very different backgrounds and circumstances, their lives follow somewhat parallel paths. Both girls wish to escape beyond their pre-determined roles. Hetty dreams of freedom from slavery, while Sarah can't imagine a life as a Southern wife and mother. She wants to be a lawyer like her father. Sarah also holds a moral repugnance towards slavery that the rest of her family doesn't have, which leads her to help Hetty in ways that could get them both in a lot of trouble, such as teaching Hetty to read. As the girls mature into women, both keep pushing towards their respective freedoms. Hetty helps in the planning of a slave revolt, while Sarah becomes more vocal in opposition to slavery and the suppression of women. "The Invention of Wings" is too grand of a novel for me to go into much more detail, and since I'm also on a deadline, I'm going to quit with the recap here and going into whether I liked it or not. And that answer is yes. I was a little reluctant to read this, as I had read a previous Kidd book and it didn't really do anything for me. But I found "Invention" to be a very strong story. My interest in the book increased about half-way through when I realized that - it's historical fiction! Sarah and Hetty are real people! Who knew? Well, probably anyone who reads the book jackets or a review of the book before reading it. But since that is something I generally don't do - I had no idea. Sarah Grimke was actually the first person to develop a public argument for women's rights. Again, who knew? Man, I need to study history a little deeper. And I made my deadline with 10 minutes to spare! Whew! Goodnight! 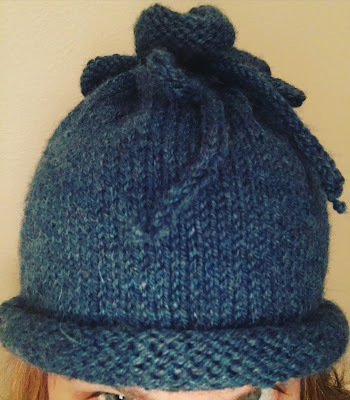 One of my goals in 2016 was to learn how to knit. While I'm musical, I've never considered myself artistic, and I'm definitely not crafty. But sewing and knitting are two things that have interested me for a long time. And since I don't have a sewing machine, I signed up for a two-hour class at Michael's. The class assignment? Fingerless Gloves. Prior to this class, I hadn't even held knitting needles before. 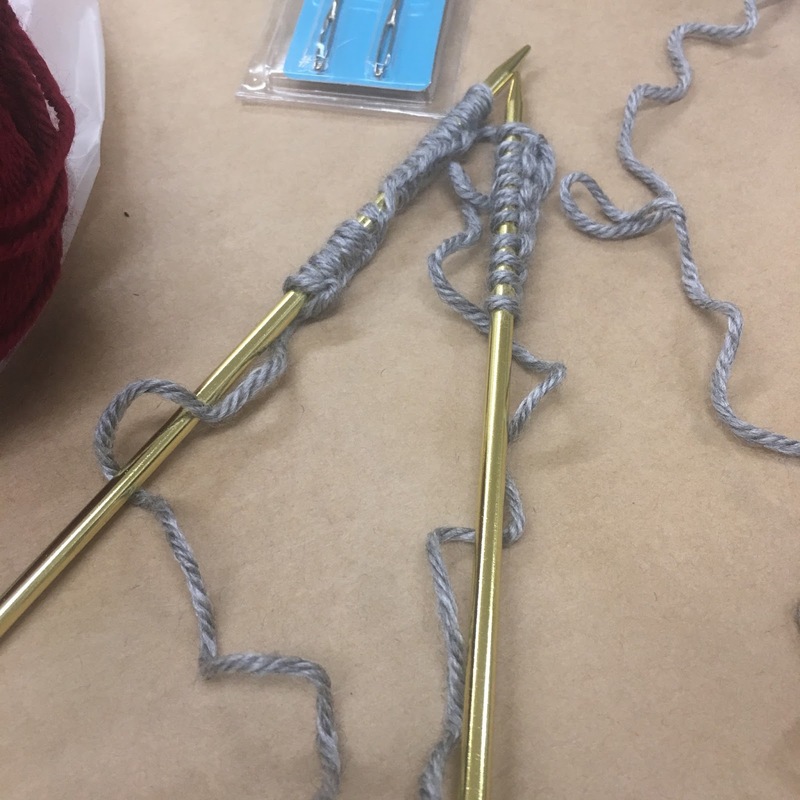 Heck - I don't think I had even seen knitting needles in person. I was completely clueless as to what I was doing. 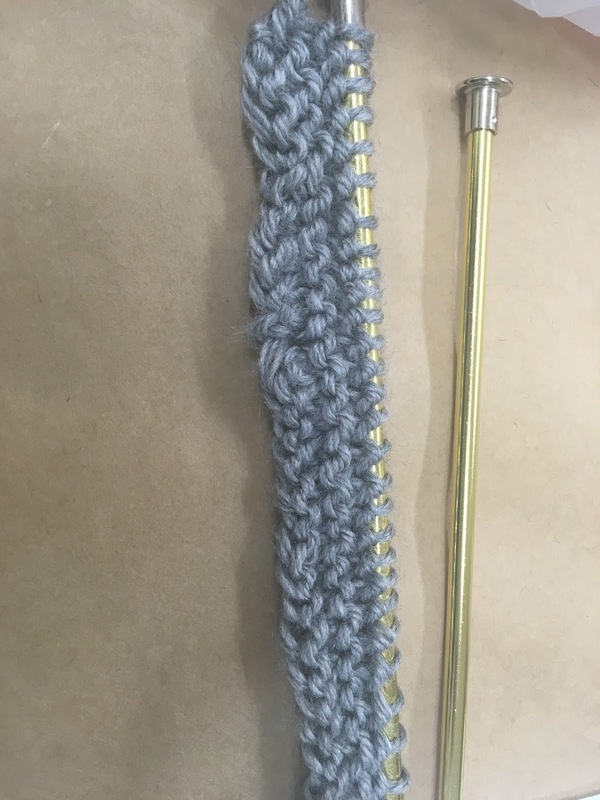 My instructor did a good job of teaching me how to cast on (putting the yarn on the needle) and also how to do the knit stitch, but I was all over the place. I hadn't felt so uncoordinated in a long time. How is this going to be gloves? Starting to get the hang of it. Unfortunately, with only two hours for the class, I could only do so much. No way was I going to get anywhere near finishing the project. But that was OK because I had already signed up for another, more intensive (but still beginner) class, at Haus of Yarn. This is a local yarn store (there are yarn stores - who knew?) and they offer a pretty large selection of classes. 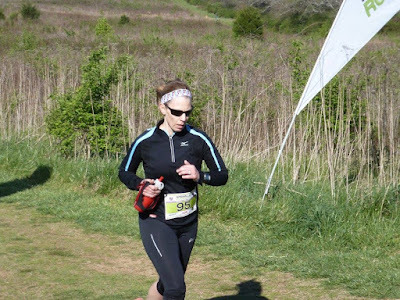 My friend Kathy (yes, the Kathy who just qualified for Boston), joined me. The class met on Tuesdays for two hours for three weeks. The project for this class was a hat. 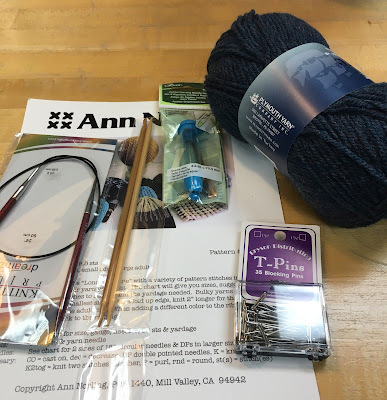 Everything you need to knit a hat. 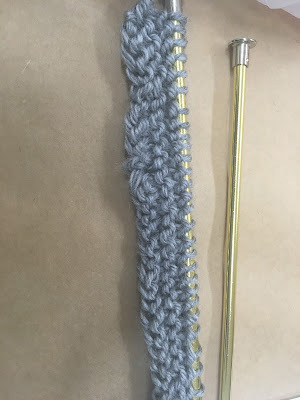 At the first class, we learned how to cast on and and the knit stitch, and I was doing OK with those since I had gone to that other class. But then we learned the purl stitch which just completely threw me for a loop. 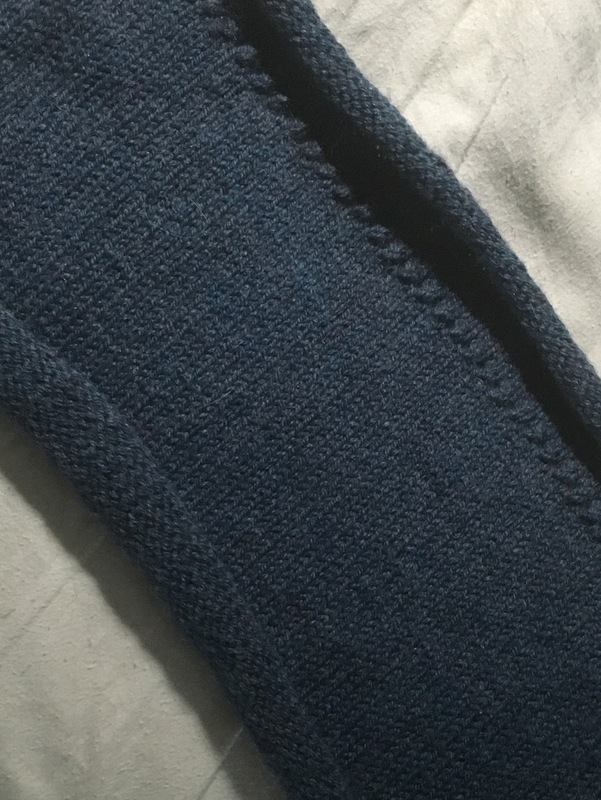 I had to keep ripping out stitches because I'd find holes in my knitting and the perfectionist in me just couldn't handle that. So I would rip everything out and start over. I think I did this four times before I finally just said "Screw it" and just kept going no matter what. The next class was pretty much us asking questions about knitting and really getting started with the hat. Then we left and worked on the hat as homework. By the last class, we were supposed to have everything knitted, and we would spend class time seaming the hat together. 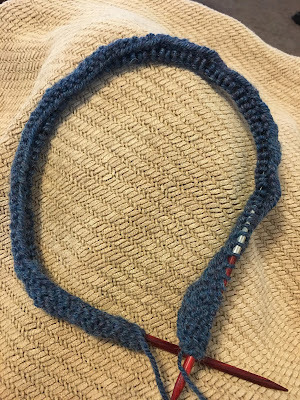 Well, unfortunately, while I thought I had my hat finished, I actually didn't and needed to spend most of the last class knitting a few more rows. The good news was that no one else had theirs finished either so we all just hung out and knit. Sandra, our instructor, showed us how to finish everything up, but we'd actually have to do it at home. THANK GOD for You Tube videos. Between the classes and those videos, I was able to finish. The hat looks pretty good huh? I'd love to take all of the credit, however, I'm fortunate to have an expert knitter who works at my office who helped me whenever I got stuck (Thanks, Bonnie!). I also made several trips to Haus of Yarn for help. Apparently, it takes a village to knit a hat. Here's the crazy thing though. I'm totally addicted to knitting now. I look at things people are wearing and I'm like "oh - I can totally make that." Which is hysterical because I totally can't! I can't make a sweater! At least not right now. 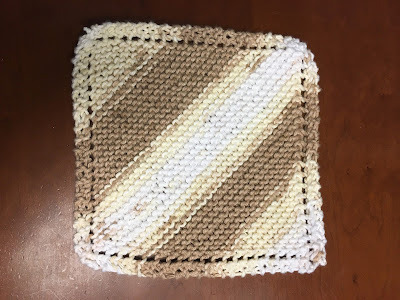 I have, however, mastered the dishcloth. "Grandmother's Favorite Dishcloth"- Designer Unknown. I'm working my way up to scarves and Mom requested an afghan, so I need to get going on that. However, I just ordered a bunch of dishcloth yarn (100% cotton, of course) because I have several patterns I want to try. Plus, dishcloths are small and I need the practice. Don't be surprised if you get one for Christmas though. 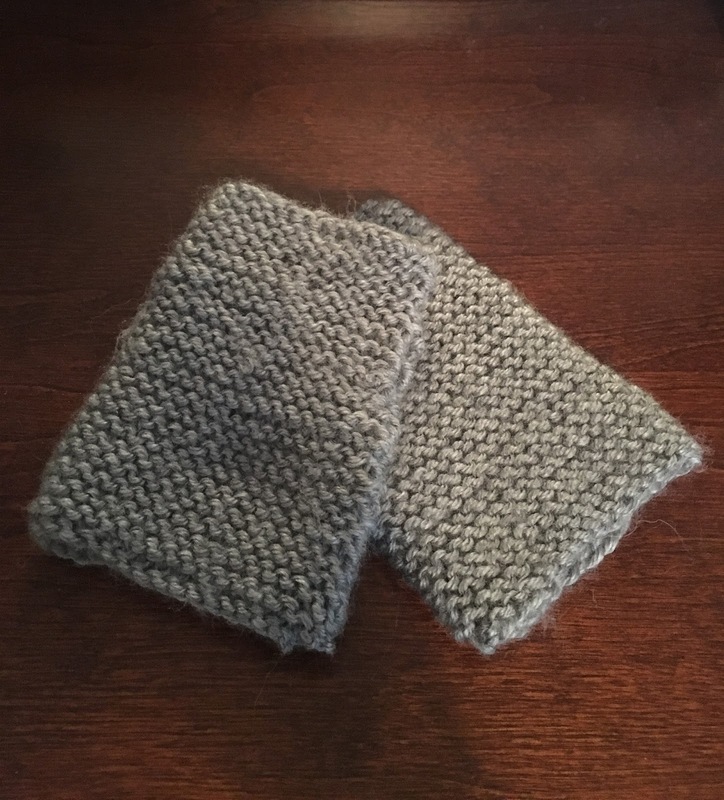 I did go back and finish my fingerless gloves too. Yes, they are basically just tubes with thumbholes, but I've actually used them at my office because it's freezing there. Not that pretty, but very functional. This entire knitting experience has made me appreciate stepping out and trying something new. I know is probably sounds silly to be afraid of taking a knitting class, but anything new can be intimidating. But I LOVE it! I even have knitting calluses! I can see how this will be something I do for the rest of my life. The only downside so far is that it's cutting into my reading time. And y'all know how much I love to read! In non-knitting news, my calf is 100% and I'm feeling like I'm close to where I was fitness-wise before the tear. The Dairy Dash is this upcoming weekend and I'm racing the 15k. Any race with ice cream at the finish is a great race to me! Hope to see a lot of you there! 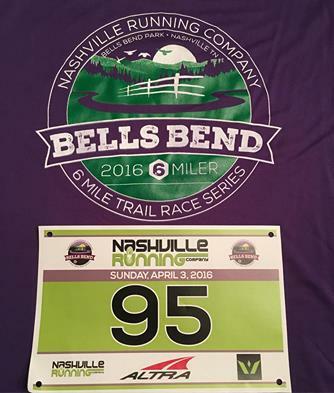 The Bells Bend 6-mile trail race was yesterday. 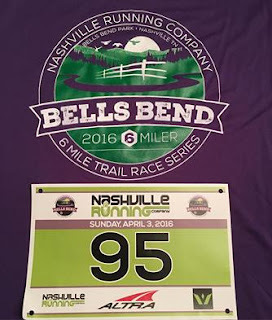 As you may know, I'm a recent convert to trail running and this race was the first for the year in the Nashville Running Company's Trail Race Series. This would be my first race coming off of my 2.5 week running hiatus after healing from a small tear in my calf muscle. How would it go? I had no idea, but there was only one way to find out. The race weekend started on Saturday with the Bells Bend Outdoor Expo as this was where you picked up your race packet. There were all sorts of vendors who were trying to lure you to explore the great outdoors: kayakers, bird-watchers, cyclists, stand-up paddlers - they were all there. It was pretty fun and I got a lot of info about sports that I had always wanted to try but didn't really know anything about. I probably should have set up a table for the Nashville Tri Club, now that I think about it. Oops. Maybe next year. Anyway, after picking up my packet I headed out to the Natchez Trace for a 3-hour bike ride. (Yes, this is relevant to the race recap - just stick with me.) The entire day had been pretty windy, but the winds were "REALLY" supposed to pick up in the afternoon. Did I pay any attention to that? Nope. Should I have? Absolutely. Why? Because the winds were a consistent 20 mph in all directions with gusts of 120 mph. OK - not really, but it felt like it at some points. The 20 mph was true though. And it was terrible. I held on to my bike so tightly that my shoulders and biceps still hurt two days later. Though I've ridden on the Trace countless times, I honestly felt like I was going to have to get off of my bike and walk up some of the hills because of the headwind. And I'm generally not afraid of heights and bridges, but I was TERRIFIED riding over the Trace bridge. 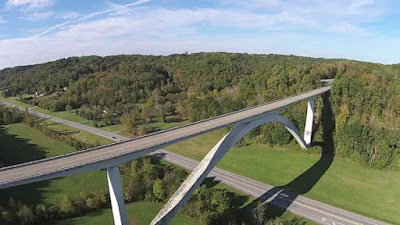 There is nothing like feeling like you're going to lose complete control of your bike while riding over one of the scariest bridges in Nashville. Because that wouldn't get windy at all. When I woke up on Sunday morning for the race, the muscles in my body were still really tense from the ride. EVERYTHING hurt. Granted, this could have also been that 3-hours was the longest bike ride I had done this season and my body didn't like that very much, but I think it was more from being battered by the wind. But I got up, did a bit of yoga to stretch out a bit, and headed over to Bells Bend. Since I had already picked up my race packet, I caught up with some friends while waiting for the race to start. It was a little chilly - in the 40's, but you knew it was going to get warm when you were running because it was really sunny out. I wore a long-sleeved shirt and capris and hoped I wouldn't get too hot. After a few announcements from the RD Beth about the course and how not to get lost (a legitimate fear on my part), we were off. The race course was more cross-country than trail. Of course, I had to be told this because I have no actual idea as to what a cross-country course looks like (I stayed as far away from running in high school as possible). But apparently, a CC course is more on grass while a trail run is on dirt and rocks. With the exception of a small creek and a lot of mud from recent rains, Bells Bend is all grass. It's flat too, for a trail race anyway. When compared to a road race, not so flat, but it's definitely flat for a trail race. However, I would like to know who put the finish line at the top of a hill. That was just cruel. While the race itself was great (fun course, well-organized, awesome people), my race was terrible. Still hurting from the previous day's ride, my legs felt like lead. It was one of those races that just hurt the entire time. Admittedly, I went out way too fast (as I am prone to do), but then I burned out quickly. By mile three, I was spent and ready for the race to be OVER. And yes, I got a little warm. Unfortunately, I still had three more miles to go. Sigh. 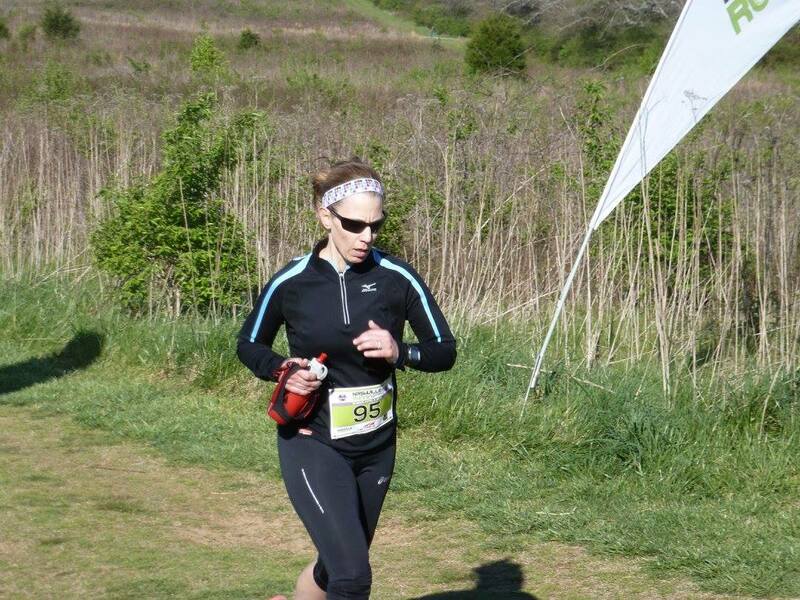 The good news was that, other than when running uphill, my calf didn't bother me and it didn't hurt at all post-race. HAZZAH! I AM HEALED! I finished the race a bit under an hour. Not great, but I felt like crap so I'm not beating myself too much. I need to get used to running with bike fatigue if I'm going to survive Raleigh 70.3 in June. I have two months to prepare. Better get busy!